Established in the year 1998, Neeta Enterprises is operating as a prominent manufacturer, exporter and supplier of Industrial Bellows and Joints. Our product range comprises Industrial Bellows, Expansion Joints etc. The offered products find wide usage in automobile, paper, plastic and food processing industries. These products are appreciated for being dimensionally accurate, resistant to wear and tear, compact in size and easy to install. We are engaged in offering Maintenance Services as well. We are exporting our product mainly in UAE Country. We have constructed a massive infrastructural facility for smooth functioning of the organization. Our manufacturing facility is loaded with high capacity machines for maintaining the international standards. We procure our raw materials from a reliable vendor base of the industry. Our quality control facility is equipped with innovative machines for checking the quality of the manufactured goods. We have a spacious warehouse for storing bulk orders. Our transportation facility is fast and has earned us a reputed name for making timely deliveries. We are supported by a team of diligent professionals for hassle-free operations of the organization. Our clients are recognized and based across the globe. We operate as a client-centric organization with a large product range and our products can be customized according to the demands of clients. Our mentor, Mr. Vijay Dhatrak, is the source of inspiration of the firm. He has nurtured the firm with his sharp business acumen and vast knowledge base. Manufacturing and Trading of qualitative rubber products. We are engaged in following stringent parameters of quality control for maintaining the quality of our products. Our raw materials are procured from a highly reputed vendor base for assuring the use of superior grade materials for fabricating our products. We check the manufactured goods in a sophisticated laboratory for ruling out defects. Our vendors are selected by checking their clientele, logistics and financial status. The products are acknowledged for their seamless finish, durability, hassle-free operations and precise size. We are highly appreciated for the large and sophisticated infrastructural facility constructed by us. Our manufacturing facility is loaded with latest generation machines for offering an exclusive range of products. We have a quality control facility for analyzing the quality of the manufactured goods. We store our bulk orders in a spacious and systematic warehousing facility for avoiding confusion and hassle during packaging. We have access to a fast transportation network for ensuring timely delivery to our revered patrons. We are supported by our team of qualified professionals. Our team comprises of engineers, quality control analysts, seasoned technicians, rubber experts and skilled workmen. All these experts work in synchrony to manufacture and supply range of industrial supplies. Abreast with latest technology, they manufacture products of unmatched quality. They have the expertise and experience to deliver rubber products as per the clients’ requirements. Owing to our prime emphasis on trust, respect and understanding in our relationship with clients we have built up a large clientele. We work consistently to offer high quality products as per the requirements of the esteemed customers. Our products have gained acceptance in India and across the globe. We strive to retain old clients as well as develop cordial relations with the new ones in order to expand our horizons. We are among the celebrated names in the domain for offering an unparalleled range of products to our clients. Our products are durable, resistant to wear & tear and seamless in terms of finish. We have a huge infrastructural facility for ensuring trouble-free operations of the organization and maintenance of the international standards. 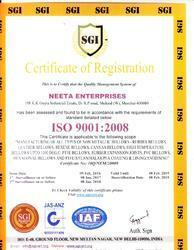 Our parameters of quality control are approved by our clients as well. We are engaged in following ethical business practices and our products are available at industry leading prices for meeting the demands of clients.